Mammals such as bears, bats, and squirrels hibernate when food becomes scarce. By hibernating, these mammals can survive the food shortage and emerge from their nests when resources are plentiful again. Each animal's hibernation behavior differs, but the effects of hibernation on their metabolism, heart rate and other body processes are similar. During hibernation, the mammal’s metabolic rate drops significantly. Metabolism is the body's process of converting food into energy. When the metabolic rate decreases, the body can survive with less food. Hibernating animals consume large quantities of food in the months before hibernation begins. Because they do not use all of the energy from this food, the extra food is converted into a thick layer of fat. While they hibernate, this fat layer is slowly used up by their body to keep their vital processes functioning. When mammals hibernate, their bodies cool down. For example, during hibernation, a gopher’s body temperature will drop to 0 degrees Celsius even though its normal body temperature is 37 degrees Celsius. According to Yellowstone National Park, bears were once thought not to be true hibernators because their body temperature did not decrease this drastically. Researchers now know bear’s heavily insulated bodies allow them to lose heat slower. To conserve energy, hibernating animals’ bodies slow down. Respiration rates decline dramatically. Bears normally take 6 to 10 breaths a minute but during hibernation, that drops to less than 2 breaths per minute. Heart rate also drops since blood does is not pumped as rapidly through the body, as less oxygenation and energy need to be delivered to the cells. The Illinois Department of Natural Resources Hibernation Guide says heart rates for the average hibernating animal can drop from 100 to 4 or 5 beats per minute. With bears, the heart rate slows but not as greatly. Bear heart rates drop from around 50 to fewer than 20 beats per minute during hibernation, according to Yellowstone National Park. Even though slowed, metabolism still produces some waste. Hibernating bears, for example, still produce urine but the amount is decreased by 95 percent. Some animals will wake up occasionally to use the bathroom. Others, including some bear species, will recycle the waste. 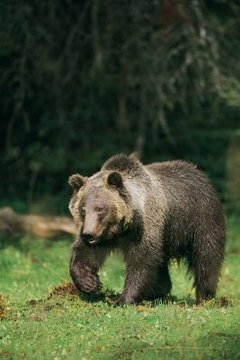 Bears use the urea, which is normally excreted in urine, to extract nitrogen that their bodies use to create protein, which helps them maintain their muscle mass even as they lose up to 30 percent of their weight during hibernation. Hibernating animals do not remain dormant during the entire period. Some mammals do wake up and leave their den or nest to defecate and urinate. Others, such as the gopher, go through periodic re-warming cycles during hibernation. Bears also remain alert for threats and can quickly awaken. As the temperatures increase, these mammals tend to have more frequent periods of awakening. Eventually a critical temperature point is reached and this signals the mammal to end its hibernation.